Redilamps are currently being used in hotels, restaurants and homes all over Europe. 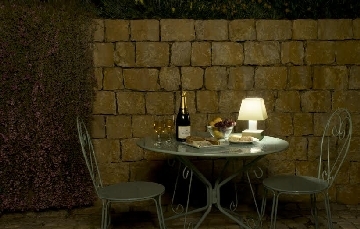 They are ideal as decorative table lamps, nursery lamps, and indoor/outdoor dining lamps. 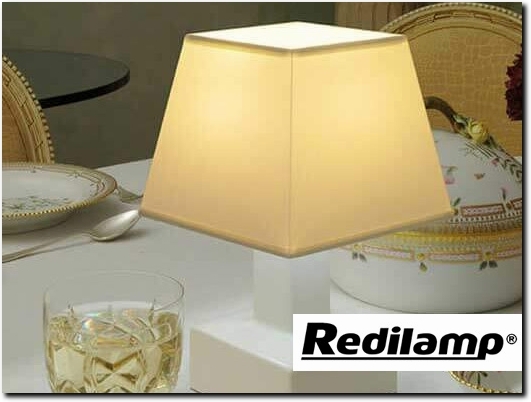 Using high quality ceramics and stainless steel, a Redilamp is a stylish solution to cordless lighting in your home. With four different light settings, choose the brightness with one simple touch. Your Redilamp can be placed on any convienient surface and provide dimmable lighting, using high efficency LED bulbs. With a range of shade colours and the choice of square or tradtional styles, there is a shade to suit any decor. This enviromentally friendly lamp is portable, practical and extremely economical. Redilamp uses advanced Ni-MH rechargeable batteries with a complete recharge taking five hours at a cost on average around a 1p a charge. Portgual (Almancil) based business providing handmade cordless lamps for sale. Website includes e-commerce facilities, photo gallery, user guide, full contact details.